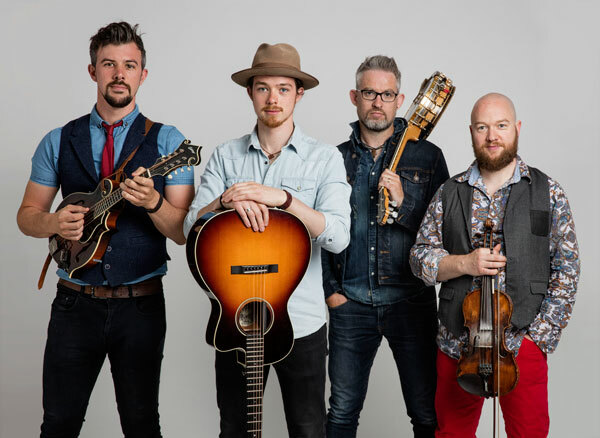 January 27, 2019 7 – 8:30 p.m.
With a "freshness and finesse bordering on the magical” (The Wall Street Journal) the four members of We Banjo 3 plays a blend of traditional Irish, Americana, and bluegrass music they call Celtgrass. Originally from Galway, Ireland, We Banjo 3 is made up of two sets of brothers: Enda and Fergal Scahill, and Martin and David Howley. Their 2016 album String Theory debuted at Number 1 on the Billboard World Music Charts —the first independent Irish band to achieve this honor. Their latest album Haven (2018) reached Number 1 on the Billboard Bluegrass Charts. In addition to banjo, the group performs on fiddle, mandolin, guitar, and bodhrán (Irish drum) in a thrilling display of virtuosity, mastery, and joy. Variously described as “astonishing,” “the Gold Standard of Irish and American Roots music,” and “the Irish Punch Brothers," We Banjo 3 is taking both sides of the Atlantic by storm, carving a reputation as one of the world’s most imaginative ensembles.